This comprehensive package allows a martin colony to thrive in your backyard. Provides your martins options for roosting, with both traditional and gourd housing. Add two types of martin housing to your backyard with ease using this Heath 18-Room Deluxe Purple Martin House and Gourds Kit. This comprehensive package helps a martin colony thrive in your backyard, offering the birds just the right type of shelter. Once you have assembled the included Heath Aluminum 18-Room Deluxe Martin House, place it on the included Heath Martin House Pole for fantastic height. This aluminum house and steel pole combination creates a comfortable and durable martin roost. To encourage colony growth, attach the three included Heath Purple Martin Gourds to the base of the home using hooks or wire (not included). This provides your martins options for roosting, and helps you enjoy both traditional and gourd housing simultaneously. Place the two included Heath Deluxe Purple Martin Decoys on the porch rails or in a gourd to better attract birds to the area. 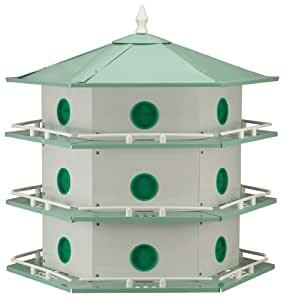 Have a successful and thriving martin colony in your backyard with this Heath 18-Room Deluxe Purple Martin House and Gourds Kit.